Good things come in threes. The iconic indie art house cinema located on Houston St. in Manhattan known as Film Forum is launching a massive retrospective series this summer titled, simply, Trilogies. As the title indicates, they'll be showing trilogies - of all kinds, ranging from the expected to the unexpected, with most trilogies showing all in the same day or in the same week. They aren't showing the Lord of the Rings or The Matrix trilogies, but they are showing Francis Ford Coppola's The Godfather trilogy, Sergio Leone's The Man With No Name trilogy (including The Good, The Bad, and The Ugly), Ingmar Bergman's "God & Man" trilogy, Satyajit Ray's classic Apu trilogy, and Krzysztof Kieślowski's iconic Three Colors trilogy, among many others. The cinema has released a trailer for their retrospective which you can check out below. The series begins this week - Friday, April 19th in NYC. 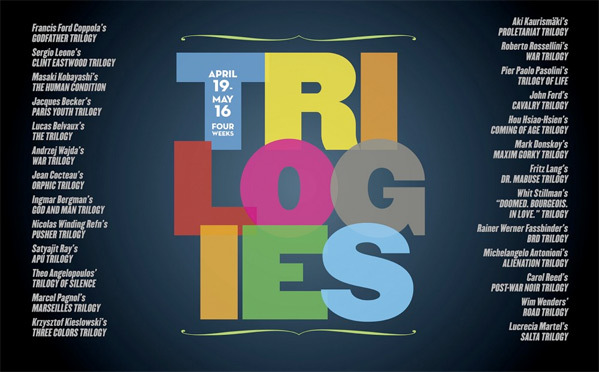 From the cinema: "Trilogies, a four-week, 78-film festival, will run at Film Forum from Friday, April 19 to Thursday, May 16. The series includes both trilogies telling a single story (such as the 9-hour Japanese film The Human Condition) and three films linked thematically by their directors. Several rare prints have been imported from all over the world especially for the series. The sweeping program ranges from well-known epics (like Coppola's Godfather Trilogy and Leone's Eastwood trilogy) to rare screenings of lesser known gems (Hou Hsiao-Hsien's "Coming of Age Trilogy" and Mark Donskoy's "Maxim Gorky Trilogy"), representing 15 different countries: United States, France, Italy, Japan, Germany, the United Kingdom, India, Argentina, Russia, Taiwan, Finland, Greece, Denmark, Poland, and Sweden." For more details and a full schedule, visit Film Forum's official website.